This is the social night of nights, and set to be another great comedy event in 2018! With the line up of Akmal and The Stevenson Experience, you cannot miss this hilarious extravaganza. Akmal returns with his funniest show ever in the history of comedy. The Stevenson Experience are Australia’s favourite bickering identical twins. Settle in for hilarious songs that have seen them compared to Flight of The Conchords, Tim Minchin & Bo Burnham, mixed with their trademark sibling rivalry banter. In 2017 the Stevensons swept the world, selling out entire seasons everywhere from the Melbourne Comedy Festival to the Edinburgh Fringe and picking up a Best Comedy Nomination for the third year in a row at FRINGE WORLD. After all that, you’d think they’d have started to get along. You’d be wrong. 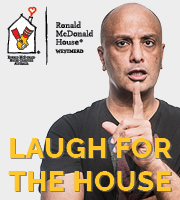 As a not-for-profit organisation, it’s the support from the community that allows Ronald McDonald House Westmead to keep the doors open for seriously ill children and their families … and supporting the House is as simple as buying a ticket and coming along. Please note: Due to the unpredictable nature of comedy, this is an 18+ event.